Google Home's features (including the Google Home Mini and Max) now including working with your TV. Although you can't physically connect a Google Home to a TV, you can use it to send voice commands through your home network to a TV in several ways that, in turn, allow you to stream content from selected apps and/or control some TV functions. Let's check out some of the ways you can do this. Google Home can be used with televisions from a variety of manufacturers including, but not limited to, those made by LG, Samsung, Panasonic, Sony, and Vizio. Before implementing any of the following options, make sure your Google Home is set up properly. One way to connect Google Home with your TV is via a Google Chromecast or Chromecast Ultra media streamer that plugs into to any TV that has an HDMI input. Typically, a smartphone or tablet is used to stream content through the Chromecast so you can see it on a TV. However, when a Chromecast is paired with Google Home you have the choice to use Google Assistant voice commands through your smartphone or Google Home. To get started, make sure that the Chromecast is plugged into your TV and that it, your smartphone and Google Home are on the same network. This means that they are connected to the same router. Turn the TV on, and make sure the Chromecast screen is showing on your TV. Tap the icon in the top right corner that looks like a box with a speaker in it (this is the Devices icon). On the next screen, click Add New Device. After Wi-Fi is set up, go back to the Google Home App and hit Continue. You will see a code on your TV and on your smartphone–if they match, hit Next. This will allow you to select your region and choose a name for your Chromecast (such as living room, or you can use the default if you want). Scroll Down to More Settings. Go to TVs and Speakers and tap + icon on the bottom right of the screen). Select the device you want to link/pair with your Google Home and follow any additional setup instructions. Also, you can use Nickname to label your device, and Rooms to assign one or more devices to a specific location. When linking/pairing is completed, just tap Done. You cannot use Google Home voice commands to watch (cast) content from apps outside of those listed above. To view content from any additional desired apps, they have to be sent to the Chromecast using your smartphone. Check out a listing of all the available apps. On the other hand, you can use Google Home to ask Chromecast to perform additional TV functions (may vary with app and TV). Some commands include Pause, Resume, Skip, Stop, Play specific program or video on compatible service, and turn subtitles/captions on/off. Also if content offers more than one subtitle language, you may be able to specify the language you want to be displayed. If your TV also has HDMI-CEC and that feature is enabled (check your TV's HDMI settings), you can use Google Home to tell your Chromecast to turn the TV on or off. Your Google Home can also switch to the HDMI input the Chromecast is connected to on your TV when you send a voice command to start playing content. This means that if you are watching a broadcast or cable channel, and you tell Google Home to play something using the Chromecast, the TV will switch to the HDMI input that the Chromecast is connected to and start playing. Check out more tips on using Google Home with Chromecast. Linking Chromecast with Google Home is one way to use Google Assistant voice commands to stream video to your TV, but there a number of TVs that have Google Chromecast Built-in. This allows Google Home to play streaming content, as well as access some control features, including volume control, without having to go through an additional plug-in Chromecast device. If a TV has Chromecast built-in, use an Android or iOS smartphone to perform preliminary setup using the Google Home App. To link the TV with Chromecast Built-in to Google Home, on your smartphone use the same steps explained above in the Use Chromecast section, beginning with the More Settings step. This will allow the TV with Chromecast Built-in to be used with your Google Home device. The services that Google Home can access and control with a Google Chromecast are the same as those that can be accessed and controlled on a TV with Chromecast Built-in. Casting from a smartphone provides access to more apps. If you are watching broadcast or cable, when you tell Google Home to play a video from one of the selected apps, the TV will automatically switch from the channel to the app. Google Home can't turn your TV on or off as it can when going through an external plug-in Chromecast. However, this may be updated in the future. Chromecast Built-in is available on select TVs from LeECO, Philips, Polaroid, Sharp, Sony, Skyworth, Soniq, Toshiba, and Vizio (LG and Samsung are not included). Another way you can connect Google Home to your TV is via a third-party universal remote control system such as the Logitech Harmony Remotes: Logitech Harmony Elite, Ultimate, Ultimate Home, Harmony Hub, Harmony Pro. By linking Google Home with a compatible Harmony Remote system, you can perform many of the control and content access functions for your TV using Google Assistant voice commands. Here are the initial steps that will link Google Home with compatible Harmony Remote products. Start off by saying "OK Google, ask harmony to link to my account". Open the Google Home App on your smartphone, and you should see, Link To Harmony displayed on the screen. Press Link in the bottom right-hand corner.Note: If you don't see the Link to Harmony displayed on your screen, just click on the menu icon on the top left of the Google Home app screen, tap Explore, scroll down to Harmony, and then tap Link. Sign in with a Logitech Harmony username and password. You will be taken to a couple of screens labeled Select Activities. This is where you can choose what you want Google Home to ask Harmony to control with your voice commands. Once you are done with the activities screens, you will come to a final screen that displays Now for the fun part. Just click on Link Account at the bottom of the screen and your basic set-up is complete. For a review of the above steps, as well as examples of how you can customize your setup further, including sample voice commands and shortcuts, check out the Logitech Harmony Experience with Google Assistant Page. Tap the page icon on the bottom right corner of the screen. Scroll down and activate the Harmony-supported TV on/off Applets (follow any additional instructions). The above steps will link the "OK Google–Turn on/off the TV" commands to your Google Home and a compatible Harmony Remote control system. Check out some additional IFTTT Applets that you can use with Google Home and Harmony. If you have a Roku TV or Roku media streamer plugged into your TV, you can link it to a Google Home using the Quick Remote App (Android Only). To get started, download and install the Quick Remote app on your smartphone, then follow the instructions outlined on the Quick Remote App download page (​better yet, watch the brief setup video) to link Quick Remote to your Roku device and Google Home. Once you have successfully linked Quick Remote with your Roku device and Google Home, you can use voice commands to tell Quick Remote to execute menu navigation on your Roku device so that you can select any app to start playing. However, the only apps you can address by name directly are the ones mentioned previously that Google Home supports. The Quick Remote app works the same way on both plug-in Roku devices and Roku TVs (TVs with Roku features built-in). Quick Remote can be used with either the Google Home or Google Assistant apps. This means if you don't have a Google Home, you can control your Roku device or Roku TV using the Google Assistant app on your smartphone. If you aren't near your Google Home, you also have the option to use the Quick Remote app keypad on your smartphone. Quick Remote is free to install, but you are limited to 50 free commands per month. If you need to have the ability to use more, you will need to subscribe to the Quick Remote Full Pass for $.99 per month or $9.99 per year. Roku TVs, sticks, and boxes can also be controlled directly by Google Assistant and Google Home for many commands, without necessarily having to go through Quick Remote. Find out how. If your TV is part of a custom installation that is centered around a comprehensive remote control system, such as the URC (Universal Remote Control) Total Control 2.0, linking it to Google Home is a little more complicated than the solutions discussed so far. If you want to use Google Home with your TV and URC Total Control 2.0, an installer is required to set up the link. Once linked, the installer then develops the entire command infrastructure you need to operate and access content on your TV. You have the choice of letting the installer create the needed voice commands, or you can tell him/her what commands you would like to use. For example, you can go with something basic, such as "Turn on the TV", or something more fun like "OK–It is time for movie nite!". The installer then makes the phrases work with the Google Assistant platform. Using the link between Google Home and the URC Total Control system, the installer can combine one or more tasks with a specific phrase. "OK–It is time for Movie Nite" can be used to turn on the TV, dim the lights, switch to a channel, turn on the audio system, etc... (and maybe start the popcorn popper–if it is part of the system). 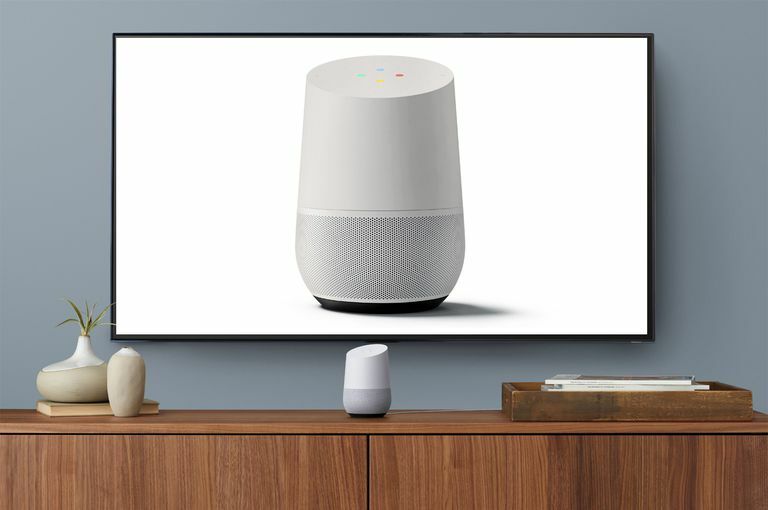 Although Google Home, in combination with additional devices and apps, is a great way to connect and control what you see on TV–Google Assistant is also incorporated into select TVs directly. LG, beginning with its 2018 smart TV line, utilizes its ThinQ AI (Artificial Intelligence) system to control all TV and streaming functions, as well as control other LG smart products, but switches to Google Assistant to reach out beyond the TV to perform the functions of a Google Home, including control of third-party smart home devices. Both the internal AI and Google Assistant functions are activated via the TV's voice-enabled remote control–no need to have a separate Google Home device or smartphone. On the other hand, Sony takes a slightly different approach by using Google Assistant on its Android TVs to control both the internal TV functions and linking with external smart home products. With Google Assistant built into a TV, instead of Google Home controlling the TV, the TV is controlling a "virtual" Google Home. However, if you do have a Google Home, you can also link it to a TV that has Google Assistant built-in using any of the methods discussed above–although this is redundant. Google Home is definitely versatile. It can serve as a central voice control hub for home entertainment and smart home devices that makes life easier to manage. If you have a Google Home device, try connecting to your TV using one, or more, of the above methods and see how you like it.